Are you tired of playing the same old 2048 game over and over again? Bored of the “corner method”? 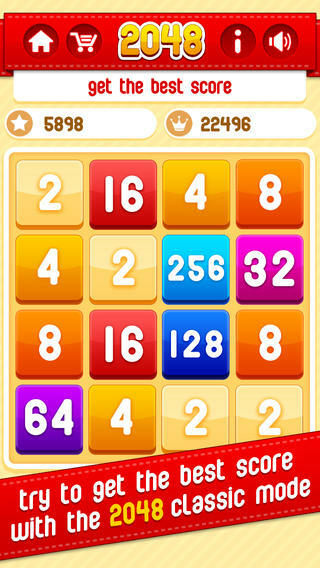 2048 plus – Challenge Edition is the game for you! 2048 Plus Challenge Edition will make you a 2048 wizard! In the Challenge edition you can find new amusing obstacles such as stone blocks, bonus blocks and division blocks. These new visual obstacles make the game more challenging and a lot more fun. You can choose between two different modes of the game. The Classic mode and the Challenging mode. The Challenge mode consists of 30 levels. Play all the 30 challenges and try to finish each level with 3 stars! The Apple Game Center is supported by our 2048 plus – Challenge Edition. Download it now!